66. Parts Of Eastern & Southeastern Nevada & Southwestern Utah. 58, 66. Parts Of E. California, S.E. Nevada, N.W. Arizona & S.W. Utah. Structure sections through the high plateaus. Geological map of the district of the high plateaus of Utah. Relief map of the district of the high plateaus of Utah. 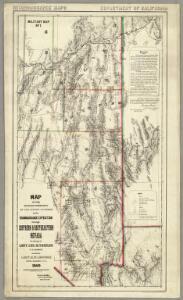 Map of the district of the High Plateaus of Utah.